As a combination of Chinese zodiac culture and stamp collecting, zodiac postage stamps are of special significance for both the stamp collectors and ordinary people. Even people who do not collect stamps, when they saw their own zodiac stamps, will also be happy about them for this “special bond”. 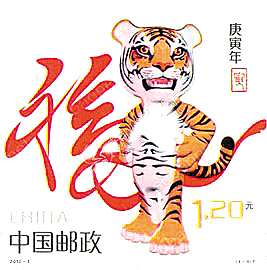 This year is a Geng-yin (Sexagenary cycle) Year of the Tiger. 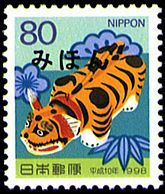 It is interesting that 60 years ago on last Gengyin Year of the Tiger, the world’s first Chinese zodiac stamp was born in Japan – of course, it was a Tiger stamp (right picture). It was issued by Japan Post in 1950. Tiger drawing is taken from a masterpiece “Painting of Dragon & Tiger ” by famous Japanese painter Maruyama Okyo. Its face value is only 2 yen, but its significance is undoubted. In the beginning, there was controversial in philatelic community about this stamp. 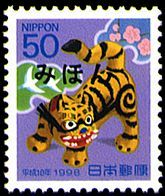 There were other countries that had issued tiger themed stamps earlier than this Japanese one. So some argued that this one issued in 1950 cannot be considered as the earliest Chinese zodiac stamp. 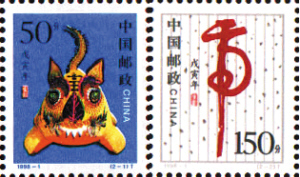 However, soon other scholars pointed out that although animal themed stamps by other countries were earlier, they had no relationship with Chinese zodiac culture. The 12 Chinese Zodiac animals were spread to Japan as early as 1000 years ago. Japanese still have exactly the same zodiac animals culture and folk custom with China. Year 1950 was indeed a Chinese Lunar Year of the Tiger. 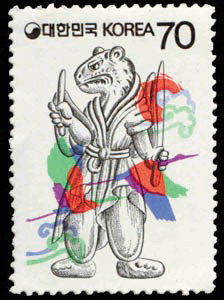 Japan has issued zodiac stamps for more than 50 years from 1950 to 2009. 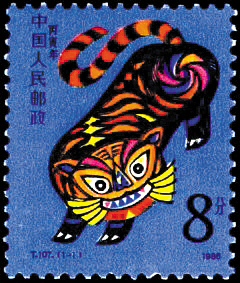 So there are sufficient grounds to conclude that this tiger stamp is the “ancestor” of all Chinese Zodiac postage stamps. 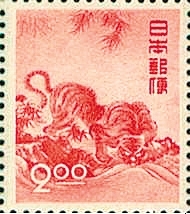 Above: Tiger stamps issued by China in 1986, 1998, 2010. 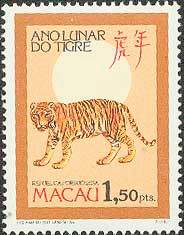 Above: Tiger stamp issued by Macau. 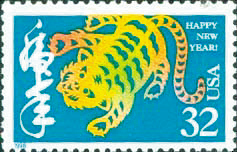 Above: Four more tiger stamps issued by Japan in 1998. 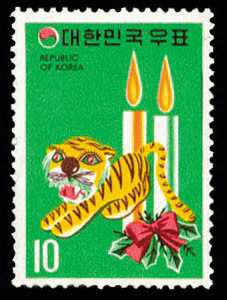 Above: Tiger stamps issued by other Asian countries: Bhutan, Singapore, Korea, and Vietnam. 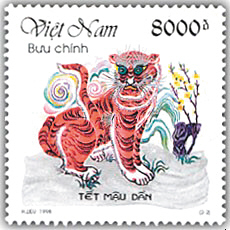 Above: Two Year of the Tiger Stamps issued by USPS. See news for current 2010 USPS tiger stamp. 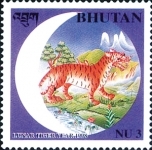 Above: And last, can somebody tell me which country is this set of tiger stamps from? Any ideas? The last set of stamps is from Laos (老挝).